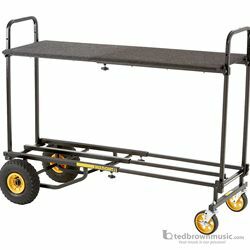 Detachable shelf instantly converts Rock-n-Roller into long shelf (50" x 16") or short shelf (32" x 16") cart. Breaks down into 2 pieces for storage. Tough powder-coated steel tube with carpet-covered 1/2" ply. Kit includes shelf, support tubes, and 4 wing bolts. Load cap. : 150 lbs. Weight: 10 lbs. Fits models R8, R10, R12.